The zhulong (literally, “dragon-pig”), a magical creature, has a snakelike body wrapped around an orifice culminating in a pig’s head with two forcefully pricked-up ears, round eyes, and a flat, wrinkled snout. It is a hybrid being, and the cross between pig and snake reflects a society of farmers and stockbreeders. Ancient Chinese jade was an extremely hard nephrite in this instance displaying rust-colored flecks later replaced by jadeite in the 18th century. Jade was particularly difficult to work without metal tools and had to be polished by means of abrasive powders, grinding and milling, a process that involved intense effort as well as a real expertise. A brittle material, jade was assigned special roles. As an embodiment of the geologically convulsive subterranean world, it ennobled and enhanced the status of its possessor. Moreover, the permanent quality of the material itself favoured the transmission of immemorial archetypes. 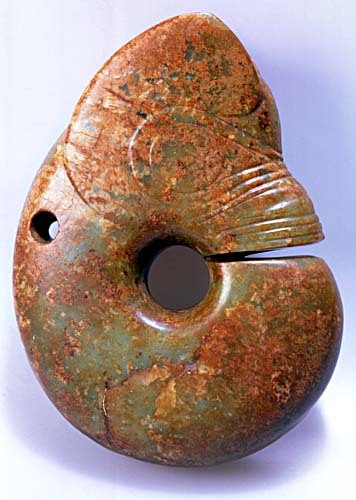 The specificity of the Chinese Neolithic period lies in the importance attached to jade. In northeast China, the Hongshan culture (3500-2500 BCE), with its principal site at Niuheliang, produced zhulong, whereas the Central Eastern region, around the present-day province of Zhejiang, witnessed the emergence of the Liangzhu culture that was to find expression in the production of cong. The discovery of several groups of objects of a consistent pattern has vividly revealed the existence of a matriarchal stage in Hongshan society. Clay statuettes representing generously curved, and visibly pregnant, women appeared alongside zhulong. As some of these vestiges were unearthed in shrines, archeologists believe that the latter edifices were devoted to the cult of mother goddess figures. Fecundity and fertility were jointly worshipped in an overriding preoccupation with survival.